I know there are some people that are real serious about their sports. There's also those that are serious about chocolate. Put the two together, and you've got SportsChocolates.com. SportsChocolates.com™, a division of Better World Brands has created the #1 Fan Chocolate Collection™ and Gaming Chocolates Collection™. Both include custom chocolate stadiums and arenas and replica chocolate gaming pieces. Made from premium milk chocolate, many include complimentary chocolate accessories like foil wrapped sports balls and casino chips. Packaging choices include beautiful imprinted tins, glass jars and wood canisters, finished with hand tied ribbon and bows. I received the Chocolate Soccer Stadium for review and was immediately impressed with the packaging and unique details of the product. The chocolate itself came in a round silver tin with the words "#1 FAN" on top. A soccer ribbon was wrapped around the tin. The soccer stadium is crafted out of chocolate. And a lot of it! Over one pound of premium milk chocolate was beautifully designed to resemble a real stadium. Looking inside the stadium, you are able to view intricately cut details of what a soccer field looks like. A circular chocolate lid fit perfectly over the stadium, and it shows strong details of different sports. 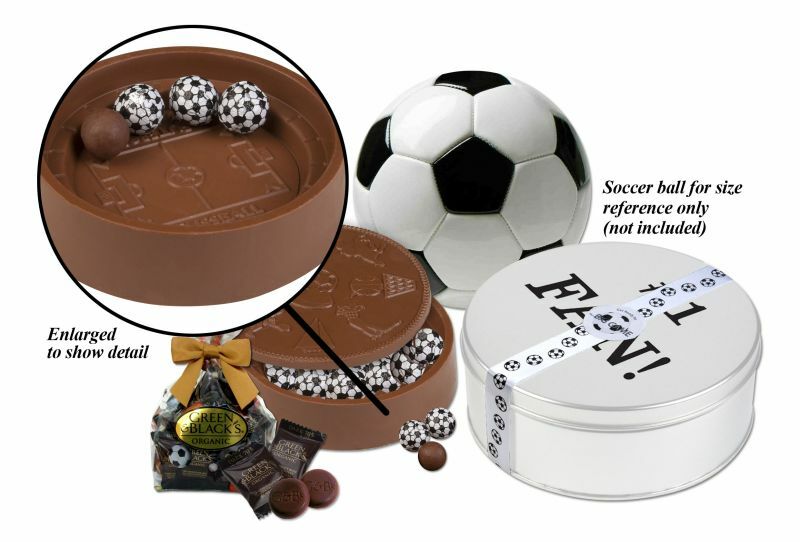 As if that wasn't enough chocolate, there are several foil wrapped chocolate soccer balls! The chocolate itself was quite tasty and we were able to tell that it was made with quality ingredients. My entire family dug in and enjoyed the chocolaty goodness. To keep the chocolate from melting when we weren't eating it, I put it back in the tin and set it in the fridge. I like the whole concept of this chocolate product and think it's perfect for a sports fan and chocolate fan. The chocolate arenas and stadiums would make fantastic sports party pieces. I do have to mention, being that I'm a big fan of roller derby, that I'd love to see a chocolate arena offered for roller derby or skating. Who among us doesn’t have a sports fanatic in their life? You’ve already given them jerseys, baseball caps and maybe even a bobblehead for their favorite team. Do something totally different this holiday season—do something delicious. This year, give them the gift of chocolate with the #1 Fan Collection offering Replica Chocolate Stadiums and Arenas. One person will win a chocolate sports stadium from SportsChocolates.com. I always enjoy volleyball. Thanks for the giveaway. Football is my favorite sport. I actually like martial arts best. My son are both in jiu-jitsu. Tae Kwon Do and softball. My son was so into basketball, so that would be my favorite sport. My favorite sport is Formula One racing. Very exciting! And they'll be racing in the United States on Halloween weekend, in Austin, Texas. My fave sport is Ice Hockey. I, myself am not a big sports fan, HOWEVER, my sweet in laws, that I love very much are a fan of all kinds of sports and since it is football season right now, If I am lucky enough to win, I'd hope to get them a chocolate football stadium to treat them to. I enjoy watching baseball the most. Our favorite sport is softball. Basketball would be my favorite. I'd have to say my favorite Sport is Tennis with Volleyball close behind! I only like sports when my kids play them. :) Football and softball are my favs. My favorite sport is soccer. Both of my daughters have played and I am the typical soccer mom. My favorite sport is ice skating. Thank you you for the giveaway! My favorite is professional football. Swimming is my personal favorite, but if I am going to watch a game, football all the way! I love to watch football but play softball! Football & basketball are my favorite sports. I like watching college football. My favorite sports is football. I love football! It was actually on my bucket list to attend the super bowl, & I DID! I like soccer & football. I, myself have been a huge sports fan, though I was always the last to be picked as a child... HOWEVER, I did play periodically and was awarded MVP in two sports -soccer & basket ball - which was the result of a single mothers inspiration, I love very much sports of all kinds! Since it is football season right now, I have not much but a small tv to watch it on and I suppose I am lucky enough tohave an old refurbished computer, I'd hope to get this prize for my step-dad as a holiday gift. My favorite sport is ice hockey! I have always had a love for tennis. I hate to watch it but love to play it. i really love hockey. love love love. Is there another sport besides baseball???? Just kidding, but we are BIG baseball fans. I love watching my daughter play softball so I guess Softball! My favorite sport (if it qualifies as a sport) is bowling. I'd have to go with football! My favorite sport is American Football. Our favorite sport is baseball...Go Yankees ! My favorite sport is baseball!